Now that I’m out, I’m finding that I must going through an out-processing of sorts. There was the talk with the pastor who wanted me to know that I was no longer welcome to play with the worship band (I told him I didn’t have a heart for it anyway with my new worldview and was looking for an out). My wife interviewed me and made notes concerning the tenets of Christianity with which I disagreed (“All of them” was not an acceptable answer). Then there was the well-meaning adult Bible class teacher who wanted to do lunch to find out what was going on in my head. Upon deconverting, I had no idea that I would have to generate my own set of ex-Christian apologetics, but that is exactly what I had to do in order to not come across as petty and shallow. I’m concluding that there are major tenets of ex-Christianity, such as the mortal Jesus (who died and stayed dead just like everybody else), Old Testament mythology (Adam & Eve, Noah’s Ark, Tower of Babel, etc. ), and the non-divinely inspired compilation of writings known as the New Testament. While these are all very important topics to come to terms with during deconversion, one of the pivotal areas of thought that underscored my deconversion, and most all of my fellow apostates on this website based on my observation, is the doctrine of Hell. Throughout history, the concept of Hell has evolved over time within the Abrahamic faiths of Judaism, Christianity and Islam. Hell, as taught to us who were in Christianity, does not exist in other world religions. Most early civilizations which developed an idea that there is some sort of existence after death aligned with the idea of an underworld where everyone goes after death, such as Hades in the ancient Greek. The ancient Hebrews had the same idea, referring to it as Sheol. To a great extent, the Hell we envisioned during Christianity was an invention of Jesus. He redefined it as the place of eternal punishment for not believing in him. Christians make a big deal that Jesus spoke more about Hell that he did about Heaven. From as far back as it can be traced, this place called Sheol, Hades, or Hell was thought to be subterranean – an under-world. At some point, the powers that be determined it was located at the center of the Earth. The reasoning behind this was that since it was believed that the Sun (and indeed the entire cosmos) all rotated around the Earth, and since Heaven was somewhere out there, then Hell had to be as far away from Heaven as possible, which was at the center of the Earth. This was put forth by Augustine in his City of God (c – 410). 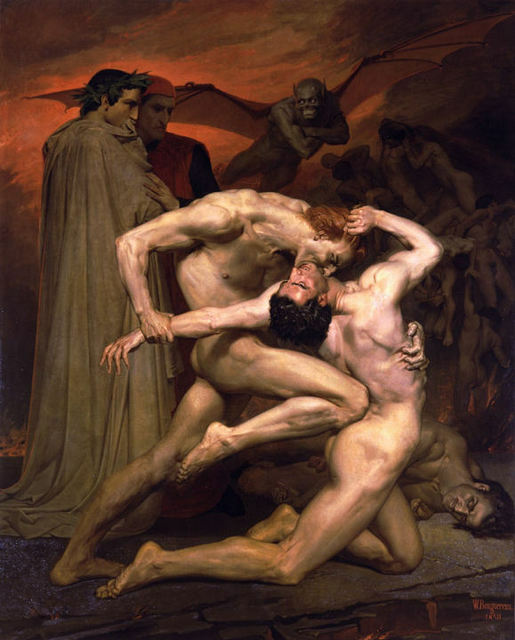 It was solidified in classical art in Dante’s epic poem Inferno (c-1300), as well as many paintings based on his work. Even after science proved that we exist in a heliocentric planetary system, Christians still believed that Hell was physically located at the center of the earth as recent as the early 1900s. One of the main blows to my faith was the deep consideration given to the doctrine of Hell, and how unreasonable it is. When trying to qualify which souls get sent there (based on mental belief systems? ), and to quantify the number or percentage of souls sent there, the entire system becomes something that cannot be divinely created. I go back to my histograph of world population to show that Hell becomes part of Christian elitism (the few privileged will enter Heaven, the rest are sentenced to burn in Hell). 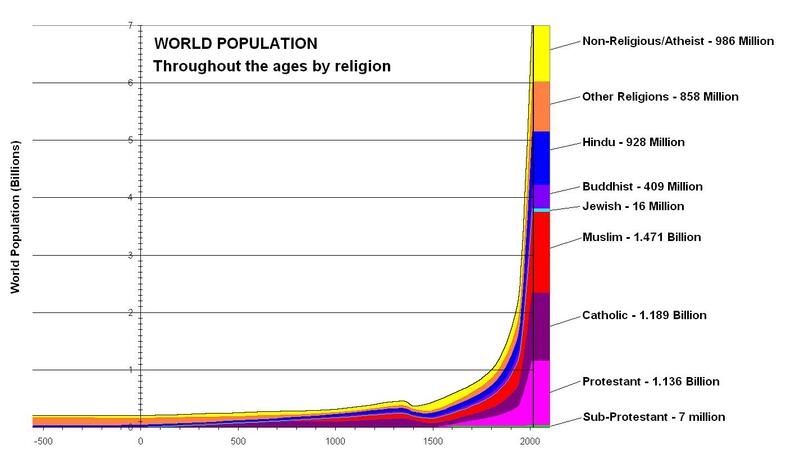 Of particular interest on the graph is the sub-protestant population, which can represent one of any protestant denomination which believes they are the one true church and all others are going to Hell. For me, it was the Calvinistic Christian Reformed Church, who believe that if you don’t believe in predestination, then you are not predestined to be one of God’s chosen… in other words, you are predestined to burn in Hell. More generally, Protestants are sure that all Catholics will burn in Hell. Catholics are sure that all Protestants will burn in Hell. Hell, there are many Protestants that think most Protestants will burn in Hell! Islamists are sure that all Catholics AND Protestants will burn in Hell. What the Hell?!?!? Christians will refer to the Book of Acts and talk about how the Berean Christians acted nobly and used reason to investigate whether the things that Paul was teaching were true or not. Ironically, when I did the same thing and concluded that the teachings were not true, I get criticized for “leaning on my own understanding”. When you remove the circular reasoning that “Hell exists because it says so in the Bible; the Bible is true because the Bible says everything in it is the true word of God”, then Hell only becomes a mythical place used by clergy to instill fear into their parishioners, starting with Pastor Jesus. One of the main blows to my faith was the deep consideration given to the doctrine of Hell, and how unreasonable it is.